Kingdoms rich in ancient grandeur, halls carved into the roots of mountains, the echoing of picks and hammers in deep mines and blazing forges, a commitment to clan and tradition, and a burning hatred of goblins and orcs—these common threads unite dwarves across the multiverse, the heritage of every dwarf character. Dwarves respect the traditions of their clans, tracing their ancestry back to the founding of their most ancient strongholds in the youth of the world, and do not abandon those traditions lightly. 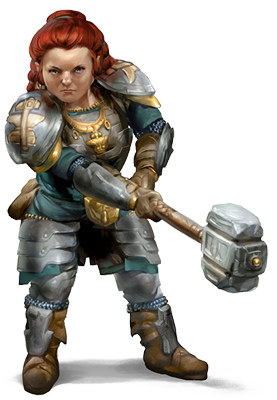 Part of those traditions is devotion to the gods of the dwarves, who uphold the dwarven ideals of industrious labor, skill in battle, and devotion to the forge. Dwarves who take up the adventuring life might be motivated by a desire for treasure—for its own sake, for a specific purpose, or even out of an altruistic desire to help others. Other dwarves are driven by the command or inspiration of a deity, a direct calling or simply a desire to bring glory to one of the dwarf gods. Clan and ancestry are also important motivators. A dwarf might seek to restore a clan’s lost honor, avenge an ancient wrong his or her clan suffered, or earn a new place within the clan after having been exiled. Or a dwarf might search for the axe wielded by a mighty ancestor, lost on the field of battle centuries ago.